Sundays always remind me that the weekend is up and the week is ready to begin! Unless I have plans or something comes up last minute, Sundays are usually spent doing laundry and relaxing at home with my dogs. (Maybe some Bravo TV- guilty pleasure). Since I'm usually just lounging around, I don't wear any makeup and instead have a mini pamper session towards the evening. I start with my favorite Facial mask, Queen Helene Mint Julep Masque, is great at helping draw out all of the weekend off of my face! My skin is a bit dry at the moment (I only leave it on for 10 min or less) I will definitely continue to use in the summer. This mask has a minty scent which I happen to love. I've tried a bevy of masks, and I always have this on hand because it truly does make my skin look and feel clean and soft. After rinsing the mask off, I pat some eye cream (Currently I am using the CVS brand called Age Renewal Deep Wrinkle Cream), this is CVS' alternative to the Neutrogena brand, and I picked this up during one of their 75% sales. For $4 I think it's a fantastic deal, and I'd wished I had picked up a back up. After my eye cream I have been applying La Roche Posay Effaclar Duo (This has been a great product for me and has helped keep my skin almost spot free!) on any spot/problem areas. This line has been getting rave reviews on the blogosphere and with good reason! As someone who has suffered with adult acne (especially in the last year), I have tried many, many acne products (ProActiv, Neutrogena Acne Wash, Clean and Clear) and even prescription topical testaments, but none were enough to make a visible difference. I can honestly say between this and the Effaclar K (which was my first LRP purchase and is nearly done!) my skin has been quite clear and almost blemish free! Would definitely recommend. I purchased the Duo when CVS (gotta love CVS' deals!) was having their $19 sale on all Effaclar products. 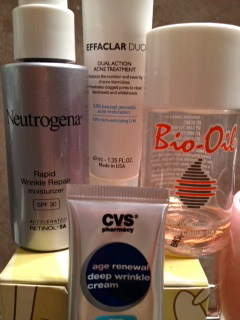 Last but not least, I finish up with Neutrogena's Rapid Wrinkle Repair Moisturizer with SPF30. This is my second repurchase of this product and although I don't see an immediate response, I think it has helped in the long run (I think we're all a bit harsh on ourselves and want quick (!) fixes). I keep reading about Estee Lauder Advanced Night Repair (Most recently on a new favorite blog I just discovered-http://hellooctoberxo.blogspot.com/2012/04/estee-lauder-advanced-night-repair.html). The link is her review on the EL Advanced Night Repair, and she mentions that this is also helpful for any scarring and Hyper-pigmentation, which is another concern of mine. It's a bit pricey, but I will definitely put it on my wish list! If my skin is feeling a bit dry (probably due to the BP in the Effaclar Duo), I like to add a couple of drops of Bio Oil. I love the slight scent of Bio Oil, I've also read that it helps to even out skin tone, so a few drops mixed in with the moisturizer feels fantastic on the skin! Does anyone else have Sunday at home Spa day? I'd love to hear about your home spa to-do's. Upon your recommendation (this post), I may actually try this Effaclar Duo! I am soo afraid of break-outs and blemishes!